Do You have Questions About Mist Cooling? Free Shipping on most all orders! on almost all of our items! FREE GROUND SHIPPING (LOWER 48 US states only). This control is the most economical solution available to control 120 volt heaters up to 1800 watts or 240 volt, single element heaters to 3000 watts or less. 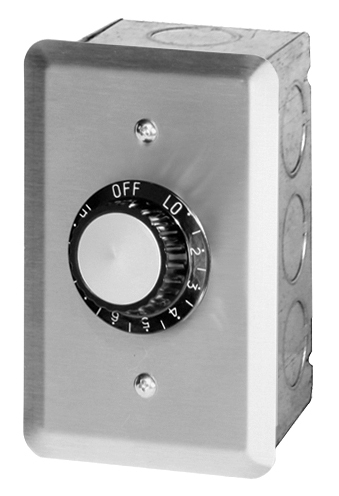 It provides on/off control and variable input regulation (cycles power on and off for varying lengths of time). It includes a gang box and stainless steel wall plate. CLICK HERE to See Our Other Infratech Heater Controls. Infratech offers a wide variety of control options for maximum versatility, energy efficiency, affordability, and ease of use. They are available in attractive in-wall models, with stainless steel wall plates, as well as all-weather units with protective covers. Systems can be controlled with simple, value-priced, input regulators (single element heaters to 3000 watts or less); duplex switches with "On/Off/Half/Full" functionality (for dual element WD series heaters to 8000 total watts); or sophisticated, solid-state controls for infinite control of larger heating systems (to 36,000 watts) or systems with more complex zoning requirements (to 9,000 watts per zone). For systems with more than 2 heaters, we suggest the use of the solid-state controls. They offer the options of multiple heating zones and timers, provide infinite variable output control, and can be incorporated into the most sophisticated EMS and automated home management systems. © Copyright . All Rights Reserved. Third Coast Trading. - Please Respect Our Copyright. Violators Will Be Prosecuted.